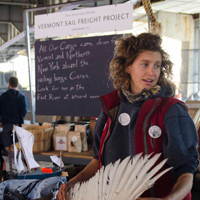 She is also the co-founder the National Young Farmers Coalition, co-founder and board secretary for Farm Hack, and the board president of Agrarian Trust. Von Tscharner Fleming, 34, lives near the town of Essex in northern New York near Lake Champlain, which is geologically the smallest of the Great Lakes. She graduated from the University of California—Berkeley in 2007 with a degree in conservation and agroecology. She one day hopes to own her own farm.